In 1942, Delbo, along with a group of women, were taken prisoner for their political crimes as members of the French Resistance. As a consequence of their rebellious acts, they were incarcerated and sent to a concentration camp left to an unbearable fate. Together, the female prisoners endured atrocities that failed humanity. They had no choice but to desperately dig deep to find hope. Yet, even among the horror and torture, they found resiliency in the human spirit. The women banded together to courageously find the strength and will to live another day. Of the 230 women who were captured, only 49 survived illness, starvation and fear of the unknown. Delba believed it was her moral obligation—her solemn responsibility—to make sure their unfathomable journey of survival and loss is heard throughout time. 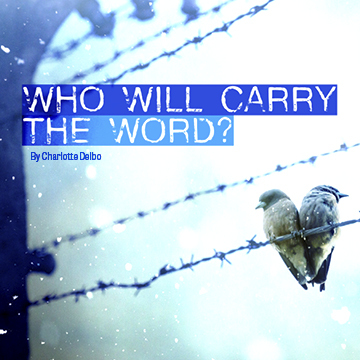 “Who Will Carry the Word” is a true testament to Delba’s journey in Auschwitz. It was a sacrifice and fight to defy the odds. It’s an expressive depiction of vulnerability and how despair can bond women. It’s just one portrayal of one of mankind’s most heart-wrenching periods in history that can’t be ignored. Ethington Theatre invites you to a production that pays homage to these women, Delbo and her purpose to chronicle crippling existence in a death camp for generations to come. Registration will be available soon. Tags: Ethington Theatre • Grand Canyon University • Who Will Carry the Word?